GWSP Delegation joined the Budapest Water Summit, Budapest, Hungary, 8-11 October 2013. To move forward the post-Rio water agenda, the Budapest Water Summit took place under the auspices of the United Nations from 8 – 11 October 2013 in Budapest, Hungary. The international conference formed part of the events of the UN International Year of Water Cooperation led by UNESCO. During the four-day conference participants representing governments, international organization, civil society, academia and the private sector elaborated on the development of water- related Sustainable Development Goals and discussed the most pressing water issues – drinking water, sanitation, waste water treatment, integrated water management, international water cooperation, innovative water technologies – with a view to defining the priorities of global development policy post 2015. The Summit concluded with the adoption of the Summit Statement “A Sustainable World is a Water – Secure World” (PDF, 1MB). 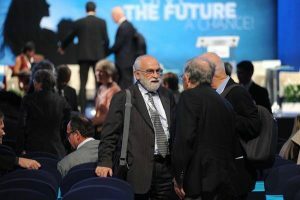 The “Bonn Declaration on Global Water Security” which was adopted during the GWSP Conference “Water in the Anthropocene”, 21-24 May 2013, was considered while drafting the Budapest Summit Statement. Janos Bogardi, GWSP Senior Advisor, moderated a high-level panel on “How to serve a growing population with water in a changing climate?” The panel discussed climate change and migration, water and food security, information networks, water diplomacy, watershed protection and specific strategies such as storage, water efficiency, pricing, and re-use. The discussion included links between water and climate change, trade-offs associated with technological solutions, and development-related challenges. 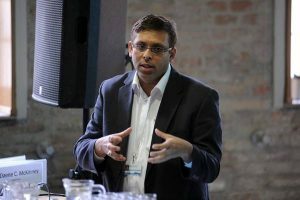 Anik Bhaduri, GWSP Executive Officer, and Claudia Pahl-Wostl, GWSP Co-Chair, were part of the Science Forum being organized within the Water Summit. 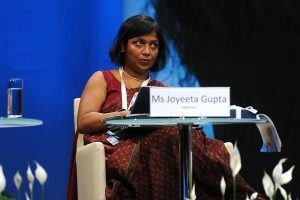 Joyeeta Gupta, GWSP SSC member, was rapporteur in the political segment on water governance. During the Summit the GWSP led (co-implemented) project of International Water Quality Guidelines for Ecosystems was officially launched.